I don’t know why I do it! Every week I buy a lotto ticket for the Saturday draw with the vague hope that I might win enough to ensure a luxurious lifestyle, at least for a little while. Yes, I know that the chances are slim, 14 million to one apparently, but knowing this doesn’t stop a little bit of me thinking “it could be you”! But each week I check my numbers and, as you may have guessed, it’s never me who bags the jackpot. In fact I can’t remember the last time I even won a tenner! And I hate to think how much I’ve spent on tickets over the years, assuming I’ve remembered to buy one every Saturday for the last 10 years, it works out at £520! Not bad if you’re guaranteed a million pound return, but this is gambling – so no guarantees! Suffice to say that my bank balance hasn’t increased dramatically as a result of purchasing this week’s ticket, but there is one thing that does makes me feel a little more like one of life’s winners – the aptly named ‘Millionaires Shortbread”. As with many Scottish sweet recipes, it is sugary, moreish and rich to the extreme (perhaps that’s why it got its name), so just the thing you need to remind you that not all decadent rewards are so unobtainable! 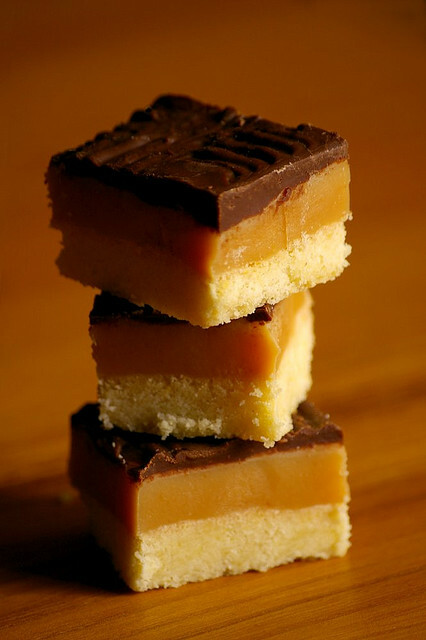 Here’s the recipe my Dundonian grandmother (whose sweet tooth was notorious) used to use, if you too haven’t hit the jackpot this week why not give it a go? If you have, then have your butler do it! 1)To make the shortbread base mix the flour and sugar in a bowl and rub in the softened butter until the mixture looks like fine breadcrumbs, bring it together to form a dough and press into a grease baking tray (one with sides) . Prick gently with a fork and then bake in a preheated oven at 180°c (or gas mark 4) for approximately 20 minutes. Remove from the oven and allow to cool. 2) Now make the caramel centre by putting the butter, sugar and condensed milk into a pan on the hob and heating slowly until the sugar dissolves. Bring the mixture to the boil, then reduce the heat to a gentle simmer, stirring continuously for about 5 minutes until the it has thickened a little. Pour this over the base and again let it all cool. 3) Finally melt the chocolate and spread over the cooled caramel mixture, then pop it all into the fridge for a bit. Once cooled, cut yourself a slice, sit back (maybe with a wee dram) and experience life as a millionaire! Previous PostWolf MoonNext PostA right to roam.